WHAT: Nathan M. Weber and Sarah Weber are headlining the House of Blues (329 N Dearborn St, Chicago, IL 60654) on January 10th, 2016 to give the crowd a ride through their experiences and views on life. Nathan has left crowds chanting for encores and will be delivering a long-lasting performance to kick off the year. Sarah will look to showcase her natural talent and immerse the room with energy. Nathan and Sarah will also be accompanied by Over the Sun, Two Weeks Notice and more to open up the show. This show is for all ages and you must have a valid I.D. to enter. 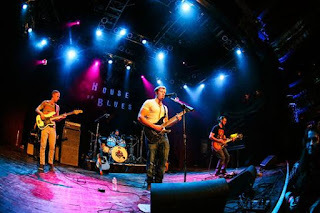 House of Blues Chicago is a standing room only venue, all tickets are General Admission unless otherwise stated. Please contact the House of Blues Box Office to purchase tickets or through Live Nation.